Is Pure Storage, Inc. (NYSE:PSTG) A Good Stock To Buy? It seems that the masses and most of the financial media hate hedge funds and what they do, but why is this hatred of hedge funds so prominent? At the end of the day, these asset management firms do not gamble the hard-earned money of the people who are on the edge of poverty. Truth be told, most hedge fund managers and other smaller players within this industry are very smart and skilled investors. Of course, they may also make wrong bets in some instances, but no one knows what the future holds and how market participants will react to the bountiful news that floods in each day. The Standard and Poor’s 500 Index returned approximately 5.7% in the 12 months ending October 26 (including dividend payments). Conversely, hedge funds’ 30 preferred S&P 500 stocks (as of June 2018) generated a return of 15.1% during the same 12-month period, with 53% of these stock picks outperforming the broader market benchmark. Coincidence? It might happen to be so, but it is unlikely. Our research covering the last 18 years indicates that hedge funds’ stock picks generate superior risk-adjusted returns. That’s why we believe it isn’t a waste of time to check out hedge fund sentiment before you invest in a stock like Pure Storage, Inc. (NYSE:PSTG). Pure Storage, Inc. (NYSE:PSTG) investors should pay attention to an increase in activity from the world’s largest hedge funds recently. The flash-based cloud-storage company reported a net loss of $28.2 million or $0.12 per share, a narrower loss than $29.4 million or $0.14 per share in the year-ago period. Non-GAAP earnings rose 225% to $0.13 per share, supported by a drop in weighted average shares along with greater adjusted operating income. In addition, the company raised its full-year 2019 guidance to reflect the forward-looking market momentum. Pure Storage recorded revenue of $372.8 million during the period, a 34% increase over the year-ago period, driven by new customers. Looking ahead, the company is forecasting revenue between $438 million and $446 million in the fourth quarter. The non-GAAP gross margin is predicted to be in the range of 64.5% to 67.5%, and the non-GAAP operating margin is forecasted to be in the range of 8% to 12%. Also, the company announced Pure Storage Cloud Data Services, a comprehensive set of services that will run on Amazon Web Services. Pure Storage’s CEO Charles Giancarlo believes this initiative will help the company bring its storage software directly to the public cloud. James N. White is the company’s largest shareholder. He snapped up 50,000 shares in 2016 for $10.12. With the company’s shares now trading at $18.91, it was a smart investment indeed. Let’s take a look at the recent hedge fund action encompassing Pure Storage, Inc. (NYSE:PSTG). Heading into the fourth quarter of 2018, a total of 31 of the hedge funds tracked by Insider Monkey were long this stock, a change of 15% from one quarter earlier. 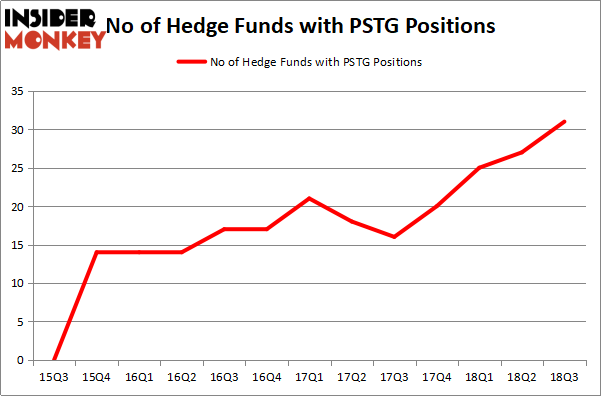 By comparison, 20 hedge funds held shares or bullish call options in PSTG heading into this year, a substantial change but not enough to warrant a place on the 30 most popular stocks among ALL hedge funds. With hedgies’ positions undergoing their usual ebb and flow, there exists an “upper tier” of noteworthy hedge fund managers who were adding to their holdings substantially (or already accumulated large positions). The largest stake in Pure Storage, Inc. (NYSE:PSTG) was held by Renaissance Technologies, which reported holding $196.7 million worth of stock at the end of September. It was followed by Citadel Investment Group with a $71.8 million position. Other investors bullish on the company included Two Sigma Advisors, Altimeter Capital Management, and Polar Capital. As industrywide interest jumped, key money managers were leading the bulls’ herd. Garelick Capital Partners, managed by Bruce Garelick, assembled the largest position in Pure Storage, Inc. (NYSE:PSTG). Garelick Capital Partners had $13 million invested in the company at the end of the quarter. Guy Shahar’s DSAM Partners also made a $1.4 million investment in the stock during the quarter. The following funds were also among the new PSTG investors: Peter Algert and Kevin Coldiron’s Algert Coldiron Investors, Matthew Tewksbury’s Stevens Capital Management, and Philippe Jabre’s Jabre Capital Partners. Let’s go over hedge fund activity in other stocks similar to Pure Storage, Inc. (NYSE:PSTG). These stocks are BlackBerry Limited (NYSE:BB), Grupo Aeroportuario del Pacífico, S.A.B. de C.V. (NYSE:PAC), Galapagos NV (NASDAQ:GLPG), and CarGurus, Inc. (NASDAQ:CARG). This group of stocks’ market valuations are closest to PSTG’s market valuation. As you can see these stocks had an average of 14 hedge funds with bullish positions and the average amount invested in these stocks was $502 million. That figure was $666 million in PSTG’s case. BlackBerry Limited (NYSE:BB) is the most popular stock in this table. On the other hand Grupo Aeroportuario del Pacífico, S.A.B. de C.V. (NYSE:PAC) is the least popular one with only 5 bullish hedge fund positions. Compared to these stocks Pure Storage, Inc. (NYSE:PSTG) is more popular among hedge funds. Considering that hedge funds are fond of this stock in relation to its market cap peers, it may be a good idea to analyze it in detail and potentially include it in your portfolio. Hedge Funds Are Crazy About Weyerhaeuser Company (NYSE:WY) Do Hedge Funds Love CorePoint Lodging Inc. (NYSE:CPLG)? 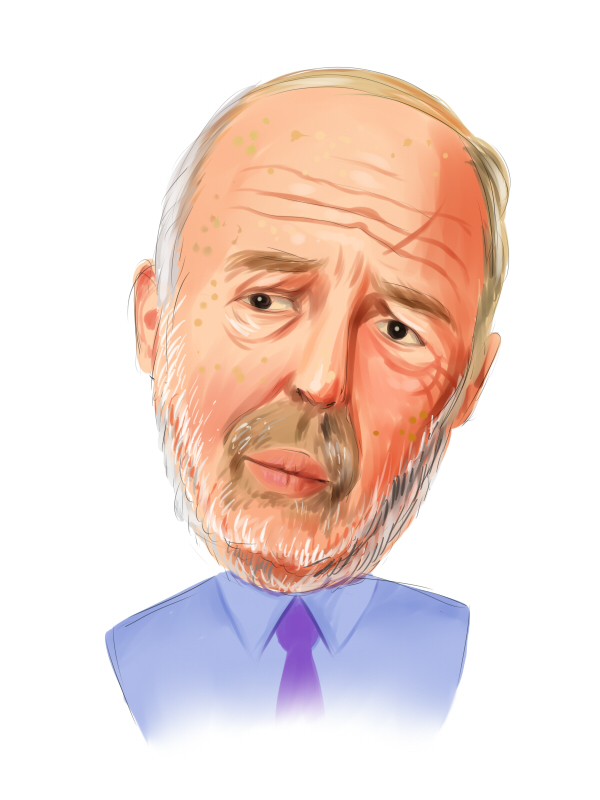 Here is Why You Should Buy Alphabet Inc (GOOGL) Now Here is What Hedge Funds Think About Mastercard Inc (NYSE:MA) Should You Buy The St. Joe Company (NYSE:JOE)? Is Omnicom Group Inc. (NYSE:OMC) A Good Stock To Buy?